In the spring of 1953, on the day that the ice breaks up on the Saskatchewan river system, an eccentric music teacher tells the story of her father, Lewis William Hutchinson, who was a judge during the Indian Mutiny of 1857, revealing his mother confined to an asylum run by the East India Company, his three wives, all named Elizabeth, in a last attempt to discover the truth of the man behind the judge’s robes -- and the fate of his first Elizabeth who disappeared in the Punjab. To know a man, she writes, one must look to his women. A sweeping epic that moves as swiftly as the rivers Jesse Emma has lived by – the Ganges, The Thames, The Seine and the North Saskatchewan – HOUSE OF THE WHITE ELEPHANT is an entertaining exposé, a dramatic rendering of the British class system and its lasting impact on a generation it spawned. 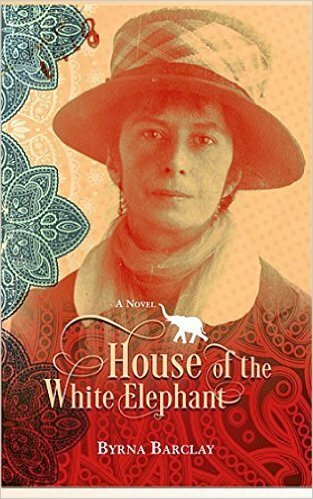 HOUSE OF THE WHITE ELEPHANT is Byrna Barclay’s tenth publication, a story loosely based on her paternal ancestry. A remarkable achievement and a great read about an uncertain time in India’s history.